With growth in incomes lagging growth in housing and utility costs, the share of Americans spending large sums of their income on housing has climbed nearly uninterrupted for decades. But the Great Recession has taken an especially heavy toll, as millions of families have slipped down the income scale due to job loss or curtailment of hours. Indeed, while households with incomes under $15,000 made up only 12 percent of all households in 2001, they made up 40 percent of the net growth in the number of households over the past ten years. Faced with reduced incomes, some of these households have moved so that they can save on housing costs but many others are instead stretching to make their rent or mortgage payments. As shown in Figure 1, even households with incomes above $15,000 (slightly above the equivalent of full-time work at minimum wage) are finding it harder to keep up with housing costs. Fully 64 percent of all households with incomes in the $15,000-$30,000 range are housing cost burdened, spending 30 percent of their income on housing and utilities. Among those with incomes of $30,000-45,000, a smaller but still substantial 42 percent are cost burdened, while more than a quarter of those with incomes in the $45,000-$60,000 range are cost burdened. These shares are each up over seven percentage points across all three of these income bands in just the past ten years. Notes: Income groups are defined using inflation-adjusted 2011 dollars. 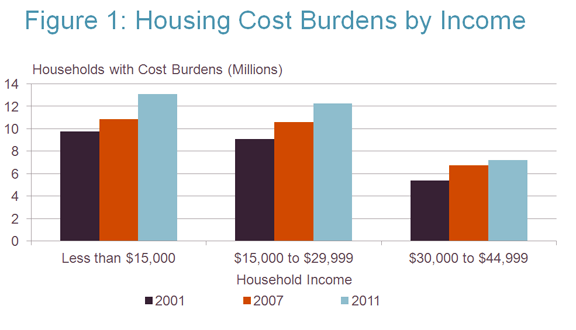 Cost-burdened households spend more than 30% of pre-tax household income on housing costs. Source: JCHS tabulations of US Census Bureau, American Community Surveys. 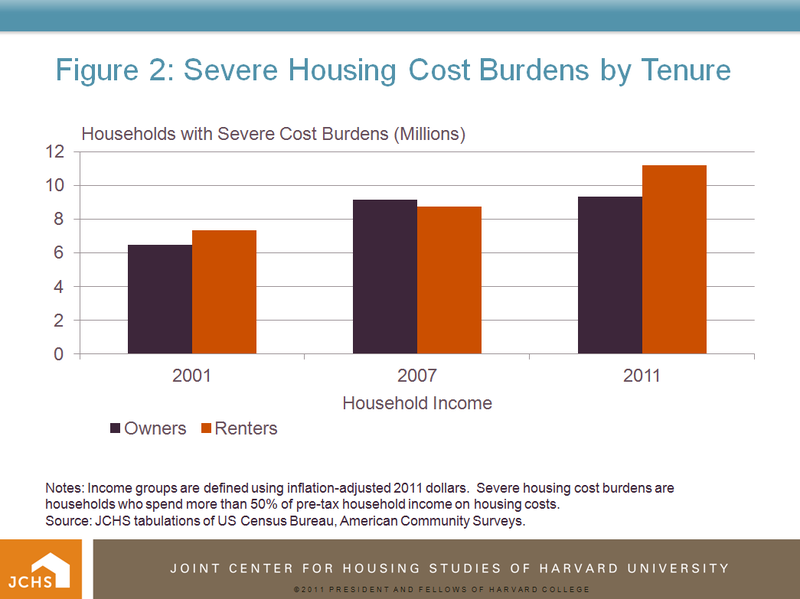 Renters and owners are both experiencing rising housing cost burdens. 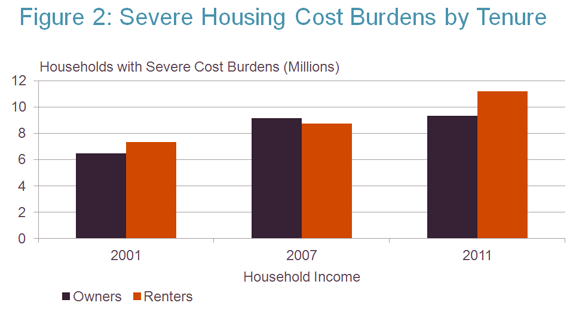 On the rental side, the share of renters with cost burdens has doubled, from a quarter in 1960 to a half in 2011, while the share with severe cost burdens (spending more than half their income on housing and utilities) shot up from 11 percent to 28 percent over that period, spiking in the last decade. Renters with incomes of $15,000-$30,000 who have severe cost burdens climbed from 2.0 million in 2001 to 3.2 million in 2011, and those with incomes of $30,000-$45,000 doubled from 300,000 to 600,000. Cost burdens have also reached record highs for homeowners. Among homeowners under age 65, 39 percent of those earning one to two times the minimum wage and 18 percent of those earning two to three times the minimum wage are now severely housing cost burdened. Notes: Income groups are defined using inflation-adjusted 2011 dollars. 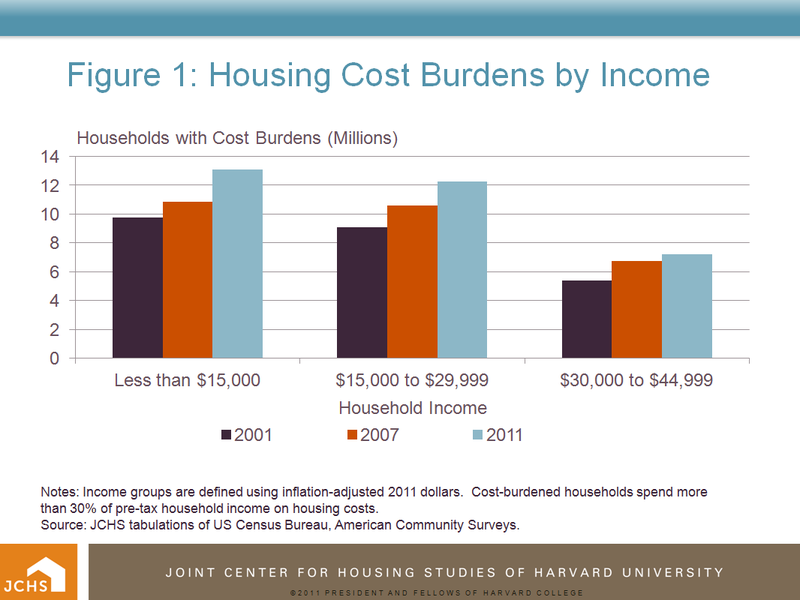 Severe housing cost burdens are households who spend more than 50% of pre-tax household income on housing costs. There is an irony to the situation of homeowners: millions of them can’t take advantage of today’s low rates to lower their housing costs because their homes are worth less than they owe on their mortgages. Despite many federal efforts to ease the path to refinancing for such owners, it remains blocked for large shares of them. Those who have loans not endorsed by FHA, Fannie Mae, or Freddie Mac are out of luck. And for those with loans endorsed by these agencies, they may still not meet credit score, debt-to-income ratio, and documentation requirements for refinancing. Even if existing owners can refinance, loss of an earner or curtailment in hours may result in payments that still stretch them thin. These affordability problems are not likely to abate any time soon. Rents are back on the rise, and in many areas sharply. Incomes remain under pressure from high unemployment rates and an ongoing shift in the composition of jobs to lower paying work, where entry-level workers in many key occupations are priced out of affordably covering their housing costs. For example, two-thirds of households that include a retail worker in the lowest wage quartile for that occupation are severely cost burdened, along with seven in ten of those including a childcare worker in the lowest wage quartile for that occupation. Meanwhile a golden moment is being missed to place people into homeownership at record low interest rates. Additionally, home prices have fallen by about a third nationally, and by much more in many places. As a result, relative to renting, the cost of owning a home for first-time buyers has not been as favorable for at least 40 years, on average, nationally. But lenders are reluctant to lend, fearful of the impact of new regulations and that they will have to buy back poorly performing loans. As a result, many would-be homebuyers are missing a chance to lower their payments relative to today’s rents and also to lock in their mortgage costs with extraordinarily low fixed-rate loans. Having so many Americans spend so much on housing is a concern not just for those affected. Housing cost burdens affect the national economy, leaving less to spend on other items and making it harder for Americans to save for the future. As an example, families with children in the bottom quarter of spenders with housing and utility payments of more than half of total outlays spent a third as much on healthcare, half as much on clothes, and two thirds as much on both food and pension and insurance as those with housing outlays of less than 30 percent. In retirement, more will be entitled to programs like Medicaid, placing strains on social service systems. 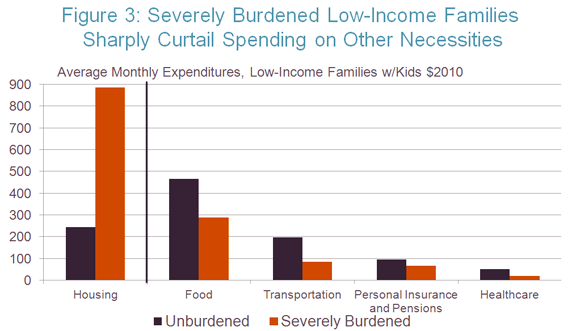 Note: Low-Income families with children are those in the bottom expenditure quartile. 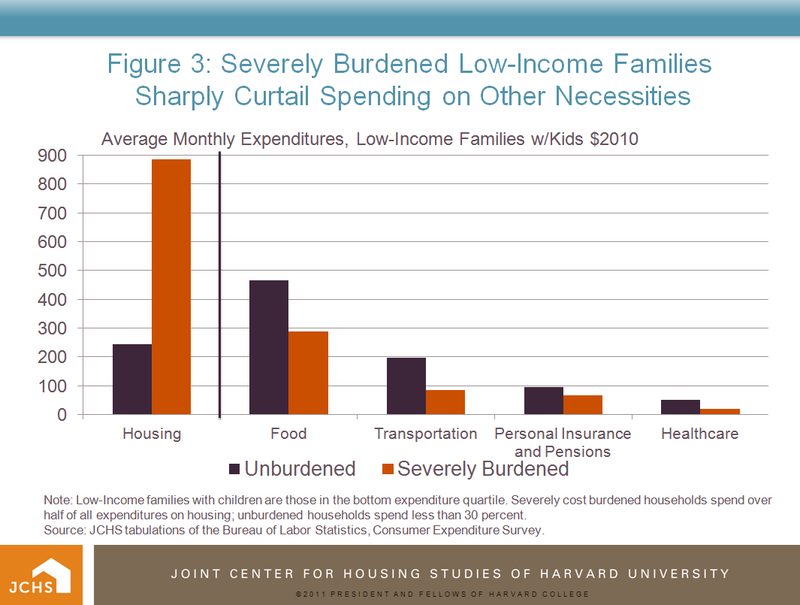 Severely cost burdened households spend over half of all expenditures on housing; unburdened households spend less than 30 percent. Source: JCHS tabulations of the Bureau of Labor Statistics, Consumer Expenditure Survey. Hemmed in by budget pressures and the enormity of the problem, our political leaders have done little to forestall or address growing housing affordability problems. Federal programs are costly and also have limited reach. Indeed, only about a quarter of all renters eligible for housing assistance (those earning half or less local area median incomes) receive it and there is essentially no comparable program to help struggling homeowners apart from a very small, temporary, emergency program put in place in 2010. Still, some places at least, have found ways to reduce housing costs in their areas through regulations and land use policies that do not involve taxpayer subsidies or tax incentives. These include some cities that are relaxing minimum unit-size requirements to encourage production of small micro-units of only a few hundred square feet. Others with markets strong enough have been offering density bonuses to encourage set-asides of affordable housing units in new construction projects. Yet most local governments continue to restrict residential densities. Lenders, meanwhile, are so cautious after having so badly missed the mark with their lending standards that many who could lock in today’s low home prices and record low rates are unable to do so. Americans will face daunting housing cost burdens that thwart savings and sap spending on non-housing items until: 1) lenders ease standards back to reasonable levels, 2) homebuilders are freed of barriers preventing them from building at greater densities, and 3) governments provide greater tax incentives or subsidies to close the gap for more low and moderate-income households between what they can afford and the costs of market-rate housing.